In this work the disturbances of the near surface electric field are investigated, which are attributed to different types of atmospheric discharges: intracloud or cloud-to-ground. The patterns of the lightning occurrences are discussed as measured by the network of the electric field mills located at the stations of Cosmic Ray Division of Yerevan Physics Institute. Discharges make changes in the near surface electric field, which can be separated into two groups. 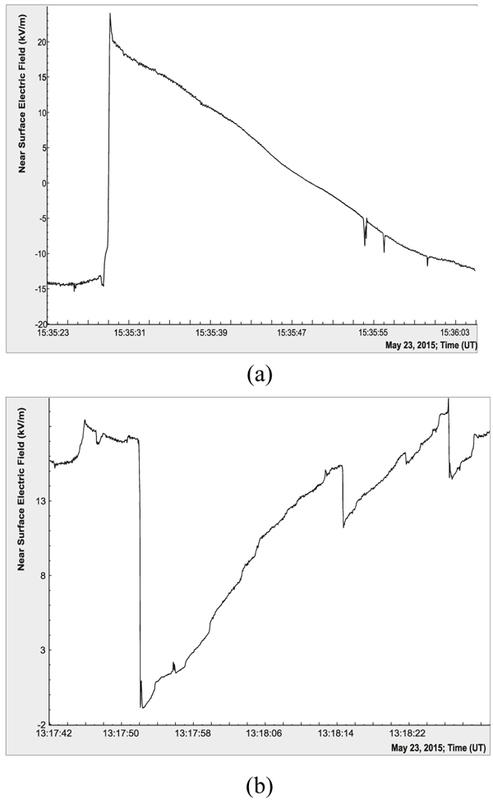 The differences of those two groups and shapes of the recovery curves are discussed using the data from electric field mills network for a stormy day on May 23, 2015. The results presented in this work show that magnitudes of field changes from one of the groups are larger and have shorter duration compared to another one. Recovery curves of the near surface electric field produced by lightning flashes also have a power-law or a linear dependence besides exponential shape. Keywords: Near Surface Electric Field, Recovery curve, Lightning, Atmospheric discharges, Intracloud lightning, Cloud-To-Ground lightning. The thunderclouds electrification processes have been investigated since the beginning of the last century. However, there are still unanswered questions related to the recovery phase behavior. Measurements of the electric field from the ground surface during thunderstorms have been used for a long time to understand the charge distribution in clouds. It is well known, that lightning causes abrupt changes in the electric field measured on the ground and alters the charge distribution above it. For instance, how can we distinguish between close or distant, Intracloud (IC) or Cloud-Ground (CG) lightning based on electric field recovery curve? In 1920, Wilson was the first who considered that recovery curves have approximately exponential shape [1Wilson CTR. Investigation on lightning discharges and on the electric field of thunderstorms, Phil. Trans. Roy. Soc. London, Ser., 1920; A, 221, 73– 115. ], reflecting a strong connection between the dissipation current and the charge at any moment. Observing the changes in the potential gradient during storms, he asserted that, when the discharge was distant one, the earth's surface potential gradient was positive, and when it was nearby one – negative. After each distant discharge, the positive potential gradient was regenerated with a characteristic recovery curve: The decreasing rate changed from a rapid to a gradual one. It was shown by Wilson [1Wilson CTR. Investigation on lightning discharges and on the electric field of thunderstorms, Phil. Trans. Roy. Soc. London, Ser., 1920; A, 221, 73– 115., 2Wilson CTR. Some thundercloud problems. J Franklin Inst 1929; 208: 1-12. [http://dx.doi.org/10.1016/S0016-0032(29)90935-2] ] and Tamura [3Tamura Y. An analysis of electric field after lightning discharges. J Geomag Geoelectr 1959; 6: 34-46. [http://dx.doi.org/10.5636/jgg.6.34] ] that nearby and distant discharges generate positive and negative sudden field changes and after that the field recovers, showing an exponential shape with a time constant equal to that charge accumulation. On the other hand [4Illingworth AJ. The variation of the electric field after lightning and the conductivity within thunderclouds. Q J R Meteorol Soc 1971; 97: 440-56. [http://dx.doi.org/10.1002/qj.49709741406] ], observations showed that distance to the discharge have a strong influence on the shape and the speed of the recovery curve. According to these investigations, the increasingly rapid recoveries at large distances from the storm can be explained by the field of the freely decaying space charge [4Illingworth AJ. The variation of the electric field after lightning and the conductivity within thunderclouds. Q J R Meteorol Soc 1971; 97: 440-56. [http://dx.doi.org/10.1002/qj.49709741406] , 5Illingworth AJ. Electric field recovery after lightning as the response of conducting atmosphere to a field change. Q J R Meteorol Soc 1972; 98: 604-16. [http://dx.doi.org/10.1002/qj.49709841709] ]. Near surface electric field disturbances (bottom, black curve) and distances to lightning discharges (top, blue curve) registered by Boltek EFM-100. Although the early observations [1Wilson CTR. Investigation on lightning discharges and on the electric field of thunderstorms, Phil. Trans. Roy. Soc. London, Ser., 1920; A, 221, 73– 115., 3Tamura Y. An analysis of electric field after lightning discharges. J Geomag Geoelectr 1959; 6: 34-46. [http://dx.doi.org/10.5636/jgg.6.34] , 6Wormell TW. The effects of thunderstorms and lightning discharges on the Earth’s electric field. Philos Trans R Soc Lond 1939; A238: 249-303. [http://dx.doi.org/10.1098/rsta.1939.0009] and 7Gunn R. Electric field regeneration in thunderstorms. J Meteorol 1954; 11[http://dx.doi.org/10.1175/1520-0469(1954)011<0130:EFRIT>2.0.CO;2] ] found an exponential shape of the recovery curve ref [8Freier G. Conductivity of the air in thunderstorm. J Geophys Res 1962; 67: 4683-91. [http://dx.doi.org/10.1029/JZ067i012p04683] ]. assumed that possible existence of a corona could bring a deviation from exponential recovering. Mackerras in [9Mackerras D. A comparison of the discharge processes in cloud and ground lightning flashes. J Geophys Res 1968; 73: 175-83. [http://dx.doi.org/10.1029/JB073i004p01175] ] showed that the intracloud flashes were mostly not impulsive discharges with low current and long duration, while CG discharges have high current and short duration. He claimed that 'normal' cloud to ground lightning will cause positive field changes at all distances, if it lowers negative charge to the ground. On the other hand, vertical cloud discharges will induce field changes of opposite signs outside of the reversal distance. In ref [10Pawar S D, Kamra A K. Recovery curves of the surface electric field after lightning discharges occurring between the positive charge pocket and negative charge centre in a thundercloud, Geophysical res. let 2002; 29(23): 2108.]. it was claimed that the near surface electric fields were the superposition of the fields produced by charges inside the thundercloud and of the space charges generated by the corona discharge near the ground. Registering different atmospheric discharges Pawar and Kamra [10Pawar S D, Kamra A K. Recovery curves of the surface electric field after lightning discharges occurring between the positive charge pocket and negative charge centre in a thundercloud, Geophysical res. let 2002; 29(23): 2108.-12Pawar S D, Kamra A K. Recovery curves of the lightning discharges occurring in the dissipation stage of thunderstorms. J Earth Syst Sci 2013; 122(2): 531-6.] tried to explain the recovery curve by breaking it in four phases, emphasizing the role of the space charges generated by the corona discharge near the ground. They claimed that after discharge the electric field variation takes place exponentially, but not in all parts of the recovery curve. Thunderstorms are very usual in our region, especially on Aragats mountain (Fig. 1 ). Lightning occurrences (blue curve) and electric field disturbances (black curve) are registered mainly during May-July, declining during the winter months. Classification of thunderstorms is presented in [13Chilingarian A, Mkrtchyan H. Role of the lower positive charge region (LPCR) in initiation of the thunderstorm ground enhancements (TGEs). Phys Rev D 2012; 86(7): 072003. [http://dx.doi.org/10.1103/PhysRevD.86.072003] ], where 4 types were discussed and almost all are accompanied with lightning discharges. The measurements of near surface electric field mill, which is installed at Aragats research station, are presented in Figs. (2a and 2b ). These two cases are observed at the ground level and correspond to atmospheric discharges. They have been separated to A and B groups (Figs. 2a and 2b ). For discharges from A group, the near surface electric field jumps abruptly to a higher value followed by a decrease of the measured electric field. The situation with the discharges from B group is opposite: the field decreases suddenly and then recovers within a few minutes or less. The term “electric field change” applies to an alteration of the near surface electric field associated with a lightning discharge. This work will be focused on the analysis of near surface electric field measurements on 23 May 2015, when hundreds of lightning discharges were occurred during storm at Mount Aragats, Nor Amberd and Yerevan. Examples of positive (group A) and negative (group B) changes of electric field produced by lightning flashes and measured by Boltek EFM-100 electric field meter. Mt. Aragats is a large stratovolcano in the North-West Armenia about 50 km from the Armenia’s capital Yerevan. It is the highest peak in modern Armenia and in the Lesser Caucasus range, located in Aragatsotn province. Aragats is a circular, shield like mountain composed of both lavas and tuff. It consists of four summits, Northern (the highest, 4090m), Western (4080m), Southern (3879m) and Eastern (3916m) forming the rim of a volcanic crater. Aragats research station of the Cosmic Ray Division (CRD) of the Yerevan Physics Institute (YerPhI) is located near large ice Lake Kari at 3200 m altitude (latitude: 40°28'N; longitude: 44°10'E). The station site is built up on solid rock foundation of volcanic origin. The Aragats research station of the Cosmic Ray division (CRD) of the Yerevan Physics Institute [14Chilingarian A, Avakyan K, Babayan V, et al. Aragats space-environmental centre: status and SEP forecasting possibilities. J Phys G Nucl Phys 2003; 29: 939. [http://dx.doi.org/10.1088/0954-3899/29/5/314] , 15Chilingarian A, Arakelyan K, Avakyan K, et al. 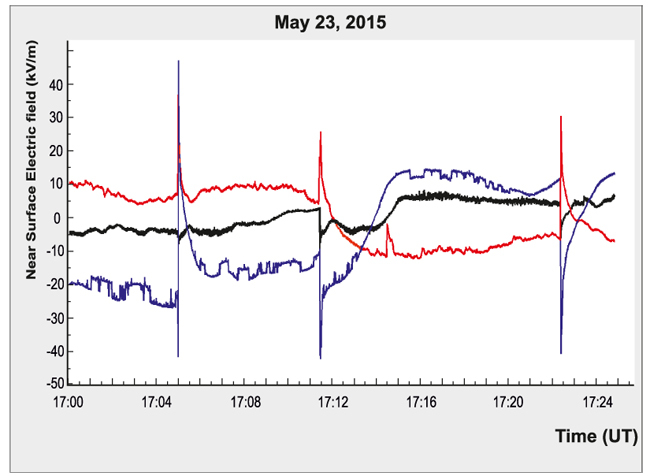 Correlated measurements of secondary cosmic ray fluxes by the Aragats Space-Environmental Center monitors. Nucl. Instrum. Methods Phys. Res. Sect A 2005; 543: 483-96.] has been functioning for more than 70 years, since 1944. The main station facilities include various particle detectors, which measure neutral and charged fluxes of secondary cosmic rays originating in the interactions of primary protons and nuclei, which incident on the Earth's atmosphere, as well as electrons, gamma rays and neutrons originating in the thunderclouds [16Chilingarian A, Daryan A, Arakelyan K, et al. Ground-based observations of thunderstorm-correlated fluxes of high-energy electrons, gamma rays, and neutrons. Phys Rev D 2010; 82: 043009. [doi: 10.1103/PhysRevD.82.043009]. [http://dx.doi.org/10.1103/PhysRevD.82.043009] , 17Chilingarian A, Housepyan G, Hovhannisyan A. Particle bursts from thunderclouds: Natural particle accelerators above our heads. Phys Rev D 2011; 83: 062001. [http://dx.doi.org/10.1103/PhysRevD.83.062001] ]. Every minute (or second) the number of particles (count rate) is stored to form time series of changing particle intensities. Additionally, we have installed weather stations, sensors of electric and magnetic fields, detectors of broadband radio emission and lightning detectors. Stable operation of all facilities is maintained 24 hours a day and 12 months a year; online visualization programs ADAS [18Chilingaryan S, Chilingarian A, Danielyan V, et al. The Aragats data acquisition system for highly distributed particle detecting networks. J Phys Conf Ser 2008; 119: 082001. [http://dx.doi.org/10.1088/1742-6596/119/8/082001] ] and ADEI [19Chilingaryan S, Beglarian A, Kopmann A, Voekling S. Advanced data extraction infrastructure: Web based system for management of time series data. J Phys Conf Ser 2010; 219: 042034. [http://dx.doi.org/10.1088/1742-6596/219/4/042034] ] provide online access to more than 300 time series of the uninterruptable measurements of particle fluxes and to the key geophysical parameters (follow the link http://crd.yerphi.am/ADEI). CRD staff has the remote control of the key parameters of detectors via wireless Internet. In this work Boltek EFM-100 electric field mill (for details, http://www.boltek.com/), is used for measuring electric fields near the surface and the distance to discharge. It registers electric fields by repeated exposure and shielding of sense electrodes. Through sense resistor, an electric charge flows from the ground to the sensor plates where they are exposed to the electric field. Charge seeps back to the ground when the sensor plates are screened, the moving charge generating an electric current. This is measured as an AC voltage, which size is proportional to the size of the electric field applied to the plates. The electric field sampling rate is 20 Hz and the measurement range is in V/m. As it was mentioned in [13Chilingarian A, Mkrtchyan H. Role of the lower positive charge region (LPCR) in initiation of the thunderstorm ground enhancements (TGEs). Phys Rev D 2012; 86(7): 072003. [http://dx.doi.org/10.1103/PhysRevD.86.072003] ] measurement accuracy of Boltek EFM-100 is 5%. Lightning can be detected as a sudden change in the electric field. Closer or distant lightning can produce different field changes. The Boltek firm devices are adapted to atmospheric electricity sign convention: according to which the downward directed electric field or field change vector is considered to be positive. In Aragats Space Environmental Center (ASEC) we have installed four Boltek EFM-100 mills (see three of them on the Fig. (3 ). And we have installed another two at Nor Amberd station and at the Yerevan station. First Boltek EFM-100 location is 12.8 km far from Mt. Aragats, and second one 39.1 km (see Fig. 3 ) [20Chilingarian A, Khanikyants Y, Mareev E, et al. Types of lightning discharges that abruptly terminate enhanced fluxes of energetic radiation and particles observed at ground level. J Geophys Res Atmos 2017; 122. [doi:10.1002/2017JD026744]]. a) Locations of Boltek EFM-100 electric field mills, b) Distance of Nor Amberd and Yerevan Boltek EFM-100 electric field mills from Aragats station. Recently, 3 cameras were installed at the station Aragats and 2 cameras in Byurakan (monitoring Ararat valley) near to Nor Amberd station as well. Images have been taken by 30 frames per second. Cameras start to operate with a specific trigger obtained from Boltek EFM, when the field becomes higher enough. The lightning activity is very high at Mt. Aragats, which is usually called “the master” of Armenia’s weather. In the average around 65 thunderstorms are happening during May-October months. 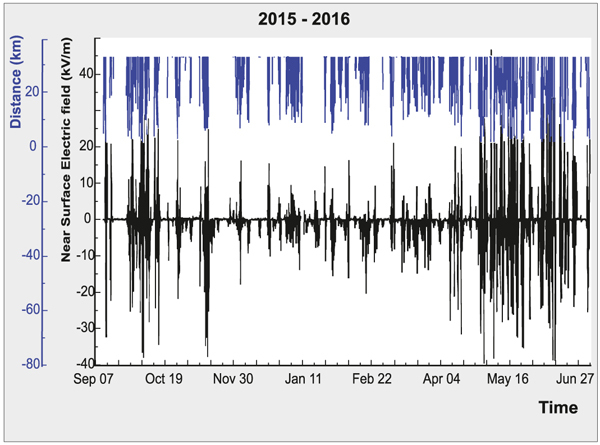 Thunderstorm activity (lightning occurrences and electric field disturbances) on the mountain is very high during May-July and tends to decline during the winter (Fig. 1 ). In the period from May to July 2015, at the Aragats station we had registered ~26 thunderstorms, which were accompanied with strong lightning activity. As we can easily note from Fig. (4 ), the storm has been registered in 3 stations simultaneously. These spikes correspond to the lightning discharges, which abruptly change the measured field. Near surface electric field disturbance during May 23, 2015 at Aragats (black curve), Nor Amberd (blue curve) and at Yerevan (red curve) stations. Distributions of lightning discharges in 3 stations are depicted in the Table (1). First column in the table is corresponded to station names, second one reveals the total number of discharges and last two are their fractions by groups indicated in the Nor Amberd station more than 800 discharges have been registered, whereas in the Aragats station there are much less. As we see from the Tables (1) B group discharges have large fractions in all stations: More than 50% of registered discharges by field mill are from B group. Discharge distribution by groups on May 23, 2015. Thus, for discharges from Group B, the field variation is larger than for the other ones. In discharges from Group B, it varies from 1.2 to 51.2 kV m-1 and for Group A from 0.55 to 33.15 kV m-1. The histograms of Fig. (5 ) show that during discharges from Group B the mean of the field changes is 12.74 and around three times higher than the mean of Group A, which is 4.164. Distributions of field changes and durations for discharges registered in Aragats station are depicted in Fig. (5 ). Comparing (1 and 3) from Fig. (5 ), it is easy to notice that for strikes from Group A, when the field abruptly increases from the initial value to its maximum (positive changes), the duration is in the range from 0.1 to 0.99 seconds. Strikes from Group B show the electric field changes(making negative changes in field values), within 0.05 to 0.55 seconds. This is significantly shorter when comparing with Group A. These durations and field values are within a broader range compared to the few events discussed in [21Chilingarian A, Housepyan G, Khanikyanc G, et al. Lightning origination and thunderstorm ground enhancements terminated by the lightning flash. EPL 2015; 110: 49001. [doi: 10.1209/0295-5075/110/49001]. [http://dx.doi.org/10.1209/0295-5075/110/49001] ]. A group Fig. 5 (2), the initial electric field ranged from -25.95 to 26.5 kV m-1 and the field peaked up to 37.3 kVm-1. B group Fig. 5 (4), the initial field ranged from -25.2 to 29 kV m-1 and it has decreased down to -49.4 kV m-1. Histograms of the period from the start of the electric field sharp decrease (increase) to its minimum (maximum) (1) an (3) and histograms of electric field changes (absolute value): A group (2) and B group (4). On the Fig. (6 ) A1, A2, A3 illustrate three different types of recoveries for discharges from A group registered at Mt. Aragats. The similar picture we have also for B type of discharges (Fig. 6 ) B1, B2, B3). In refs [22Saba MMF, Pinto JrO, Pinto IRCA, et al. Stratospheric balloon measurements of electric fields associated with thunderstorms and lightning in Brazil. J Geophys Res 2000; 105(D14): 18091-7. [http://dx.doi.org/10.1029/2000JD900053] ] and [23Burke HK. Large scale atmospheric electric fields: Comparisons with balloon data. PhD thesis 1975.] a positive correlation was found between the electric field changes and the decay time constant. The last parameter they have taken from exponential curve fit. However, the results were presented only for 9 and 6 discharges. According to our results not all discharges have exponential recovery shape. From the Fig. (6 ) A1 and B1, one can see that the near surface electric field recovers less than half of its value in 3 seconds from discharge, keeping almost linear shape. In the second case, the field recovery at the beginning is exponential then it becomes linear, and in 3 seconds reaches to the half of its maximum (Fig. 6 A2 and B2). In ref [10Pawar S D, Kamra A K. Recovery curves of the surface electric field after lightning discharges occurring between the positive charge pocket and negative charge centre in a thundercloud, Geophysical res. let 2002; 29(23): 2108.] were presented 14 flashes, where the field at first recovered very fast, then linearly and exponentially. They attributed this to the corona discharge near the ground. Form the last figures one can observe, that in 3 seconds field reaches to its initial value having power function recovery shape. Values of electric field changes, which are depicted on the Fig. (6 ) A1 and A3 are almost the same and equal to 4 kV m-1. Although, as one can notice, the recovery shapes are different. Therefore, we cannot claim that distant discharges generate small near surface electric field changes and they should recover faster than close ones as it was discussed in [4Illingworth AJ. The variation of the electric field after lightning and the conductivity within thunderclouds. Q J R Meteorol Soc 1971; 97: 440-56. [http://dx.doi.org/10.1002/qj.49709741406] ]. Fig. (6 ) A1 and A3 both can be results of close and distant lightning and they indicate to the different type of discharges. Three electric fields, which have been installed on different locations, allow analyzing field change after the same discharge is registered in all stations at the same time. This brings them closer to their classification. IC flashes neutralize charge in each pole of the dipole, and with increasing distance from the location of the discharge occurrence; the polarity of the field change also varies. Ground flashes neutralize only one polarity of charge, so at all distances from the storm at the ground the polarity of the field change remains the same [25MacGorman DR, Rust WD. The Electrical Nature of Thunderstorms 1998.]. Therefore, if polarity reversal of the field change produced by the lightning flash is observed it can be classified as an intracloud flash [24Uman M, Rakov V. Lightning physics and effects, Ch3 and 4 2003., 26Krehbiel P, Mazur V, Rison W. Standardizing the sign convention for atmospheric electric field measurements. Newsletter on Atmospheric Electricity 2014; 25(2), 27Rakov V. On the electric field sign convention, reversal distance, and the meaning of field components. Newsletter on Atmospheric Electricity 2015; 26 (1).]. During above described storm we have registered only 124 discharges at three stations simultaneously (example can be found on the Fig. (7 ), from which 46 were with field reversal at least at one of the stations. The remaining 78 discharges have the same polarity in all registered stations. If polarity reversal is not observed, the question of classification remains open, and we need to analyze additional data. Therefore, only here for 46 discharges we can claim that they were intracloud. As additional data for classification can be fast wideband electric field waveforms and optical images of lightning flash [20Chilingarian A, Khanikyants Y, Mareev E, et al. Types of lightning discharges that abruptly terminate enhanced fluxes of energetic radiation and particles observed at ground level. J Geophys Res Atmos 2017; 122. [doi:10.1002/2017JD026744]]. Fast wideband (50 Hz to 12 MHz) electric field waveforms during lightning flashes are obtained from a 52 cm diameter, circular flat-plate antenna, which is connected to a Picoscope 5244B digitizing oscilloscope [20Chilingarian A, Khanikyants Y, Mareev E, et al. Types of lightning discharges that abruptly terminate enhanced fluxes of energetic radiation and particles observed at ground level. J Geophys Res Atmos 2017; 122. [doi:10.1002/2017JD026744]]. Additionally, all lightning discharges have been checked by EFM-100 distance data, Boltek LD-250 (http://www.boltek.com/product/ld250-lightning-detector/) local and World Wide Lightning Location Network (WWLLN, http://wwlln.net/) international networks. Local networks have detected all analyzed strikes. However, only three out of 46 were detected by WWLLN for strikes with polarity reversal. According to its description, it has different detection efficiencies for Cloud-To-Ground (CG) and Intracloud (IC) discharges. For CG discharges, WWLLN is more sensitive than for IC discharges [28Abarca SF, Corbosiero KL, Galarneau Jr TJ. An evaluation of the Worldwide Lightning Location Network (WWLLN) using the National Lightning Detection Network (NLDN) as ground truth. J Geophys Res Atmos 2010; 115(D18): 2010. [http://dx.doi.org/10.1029/2009JD013411] ]. So, in the future, comparison of local and global networks with optical observation also can serve as one of the key parameters for distinguishing discharges. Electric field recovery curves during 3 seconds for A and B groups. For A1 and B1 field recovers less than half of its value, for A2 and B2 recovery is 50%, and for A3 and B3 field recovery is 100%. Every dash line on horizontal axis corresponds to 50ms measurements and the vertical axis shows measured near surface electric field. The zoomed picture of near surface electric field disturbances for May 23, 2015 event at Aragats (black curve), Nor Amberd (blue curve) and at Yerevan station (red curve). The short separate analyze for these 46 events is presented on the Table (2). Three different time periods are depicted in the Table (1). 13:11 -14:36 (I row), 2) 14:54-17:46 (II row), 3) 14:51-15:25 (III row). During first period at Aragats and at Nor Amberd stations there are 28 discharges. Simultaneously in three stations, we have 8 discharges registrations (see Table 2) second row). Observation shows that during the third period we have 10 registered discharges at Yerevan and at Nor Amberd stations. Short description for the analysis of 46 events registered at 3 stations simultaneously. Eq. 1. Fit functions for the recovery curves of electric field after discharges. Range of fitting results by Eq. 1 functions and count of types of recovery curves are depicted in the Table (2). Example of fit functions of recovery curves are illustrated in Fig. (8 ). Discharge, which is registered at 17:46:09 in 3 stations simultaneously, has power function recovery shape at Aragats and Yerevan stations, while it has linear one at Nor Amberd station. The recovery curves have the same shape as B1, B2 and A1 recoveries Fig. 6 ). Fit equations for mentioned discharge are presented below. They were very well fitted with curves. Fit parameters and recovery curves of electric field changes of discharge occurred at 17:46:09 UT at Aragats, Nor Amberd and Yerevan stations. Same discharge at Aragats and Yerevan has power function recovery shape, while at Nor Amberd it has linear one. Eq. 2. 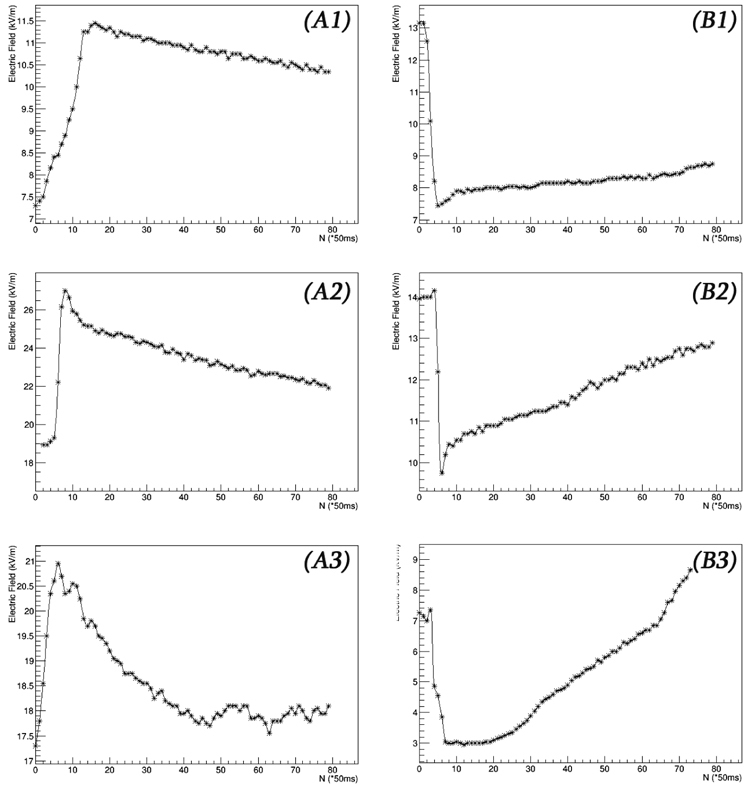 Fit functions for recovery curves of electric field after discharge registered at 17:46. Correlation between magnitude of field change and speed of field regeneration. From the fit type columns (Table 2) you can see that during the beginning of the storm, which corresponds to the part (I), we mostly have linear function for the recovery curves at Nor Amberd station, and mixed functions for Mt. Aragats. In the second part, when the storm moved a little bit towards Yerevan same is happening for Yerevan station results: recoveries become mostly linear. Comparing the results of Table (2) with Fig. (5 ) histograms, it is easy to notice that discharges at Nor Amberd station make bigger field changes (column VI) than at Mt. Aragats (column II). At the Nor Amberd for the 46 discharges field changes varies from -54kV m-1 to 53.7kV m-1. However, for time period, values of Δt (columns I and V) are in the same range as it was shown above. ΔE40 Δ t40-1 (columns III and VII) is showing speed of electric field regeneration. ΔE40 and Δt40 are differences between start of recovery and 2sec after it (every dot in Fig. (6 ) corresponds to 50ms measurements). In this work, speed of field regeneration is defined as relation of electric field changes to time period. As we see from the table, the fastest field regeneration (by absolute value) has observed at Nor Amberd station. 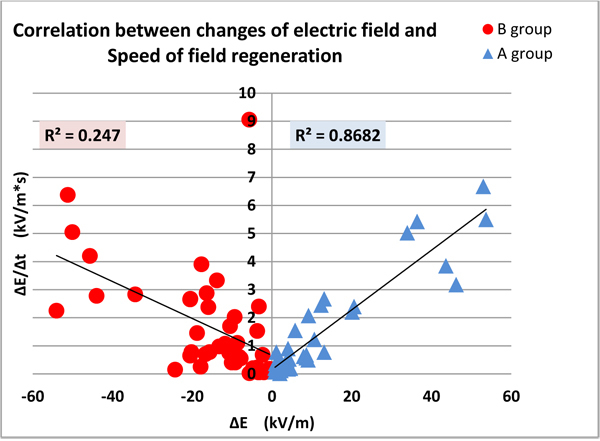 Looking for connection between field changes and speed of electric field regeneration in 2 sec, we have found positive correlation for A group. For discharges from B group there was not any correlation between mentioned two parameters. The results are illustrated on the Fig. (9 ). The results of investigations of atmospheric discharges have been presented in this work. 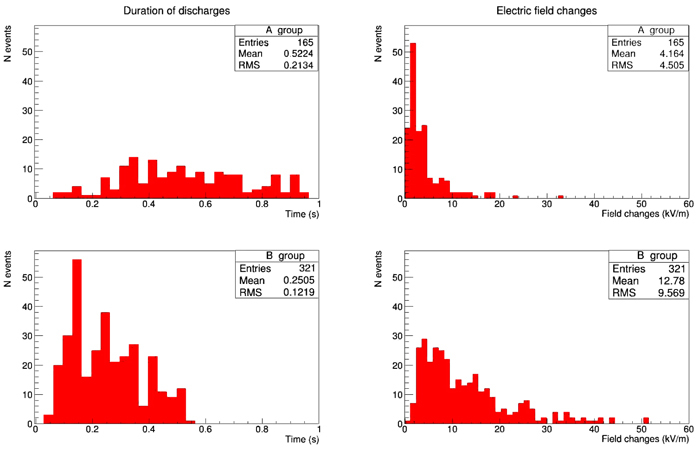 Discharges can generate two different types of field changes. As it has been illustrated above, described two discharge groups have 3 different field recovery shapes. Every recovery curve corresponds to different type of lightning flashes. Far and close lightning can have the same recovery shape but different magnitudes of field changes, or vice versa, i.e. different shapes but the same recovery magnitude of field changes, which can link to the type of lightning: IC or CG. As it was mentioned in the past [1Wilson CTR. Investigation on lightning discharges and on the electric field of thunderstorms, Phil. Trans. Roy. Soc. London, Ser., 1920; A, 221, 73– 115., 3Tamura Y. An analysis of electric field after lightning discharges. J Geomag Geoelectr 1959; 6: 34-46. [http://dx.doi.org/10.5636/jgg.6.34] , 6Wormell TW. The effects of thunderstorms and lightning discharges on the Earth’s electric field. Philos Trans R Soc Lond 1939; A238: 249-303. [http://dx.doi.org/10.1098/rsta.1939.0009] and 7Gunn R. Electric field regeneration in thunderstorms. J Meteorol 1954; 11[http://dx.doi.org/10.1175/1520-0469(1954)011<0130:EFRIT>2.0.CO;2] ] after lightning the electric field should have exponentially recovering shape. However, according to presented observations after some discharges, the electric field recovery curve obtains a power-law or a linear function shape; sometimes it looks like a superposition of several functions, which could be due to the electrification processes inside the thundercloud or below it. The comparison of two lightning groups shows that discharges from B group can have large field changes in shorter period than from A group. Besides these, observations show large positive correlation between field change magnitude and speed of field regeneration for discharges from A group. Although, B group discharges have large fractions in all stations: more than 50% of registered discharges by field mill are from B group. Paper lacks the answer to the question mentioned in the Introduction section: “Can we use ground-based electric field measurements for identifying IC and CG lightning and their characteristics?”. So we leave it as an open idea for the future research. The author thanks the staff of the Aragats Space Environmental Center for the uninterruptible operation of Aragats research station facilities. The data for this paper are available via the multivariate visualization software ADEI on the WEB page of the Cosmic Ray Division (CRD) of the Yerevan Physics Institute, http://adei.crd.yerphi.am/adei. The author is thankful to the participants of seminar in Cosmic Ray Division especially to Ashot Chilingarian and Suren Soghomonyan for useful discussions and valuable comments. Wilson CTR. Investigation on lightning discharges and on the electric field of thunderstorms, Phil. Trans. Roy. Soc. London, Ser., 1920; A, 221, 73– 115. Pawar S D, Kamra A K. Recovery curves of the surface electric field after lightning discharges occurring between the positive charge pocket and negative charge centre in a thundercloud, Geophysical res. let 2002; 29(23): 2108. Pawar S D, Kamra A K. Recovery curves of the lightning discharges occurring in the dissipation stage of thunderstorms. J Earth Syst Sci 2013; 122(2): 531-6. Chilingarian A, Arakelyan K, Avakyan K, et al. 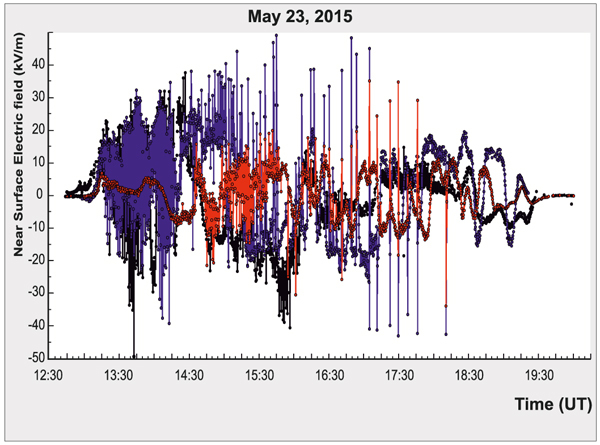 Correlated measurements of secondary cosmic ray fluxes by the Aragats Space-Environmental Center monitors. Nucl. Instrum. Methods Phys. Res. Sect A 2005; 543: 483-96. Burke HK. Large scale atmospheric electric fields: Comparisons with balloon data. PhD thesis 1975. Uman M, Rakov V. Lightning physics and effects, Ch3 and 4 2003. MacGorman DR, Rust WD. The Electrical Nature of Thunderstorms 1998. Rakov V. On the electric field sign convention, reversal distance, and the meaning of field components. Newsletter on Atmospheric Electricity 2015; 26 (1).